I was not prepared for the bread man. I thought it was a dying bird that awoke me every morning. I had expected the call to prayer to dictate the rhythm of life. But for the first full week after moving to Djibouti, birds croaked outside my window at equally consistent intervals, five times per day, until I traced the sound to its source one morning and discovered not belly-up bird carcasses, but a man honking an amplified bicycle horn to announce the arrival of fresh baguettes. 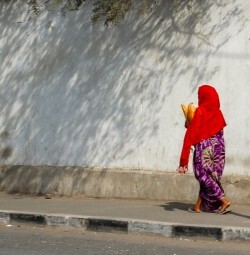 Come to find out every quartier in Djibouti City has several bread men and every bread man has a horn and a wooden cart on two rickety wheels. 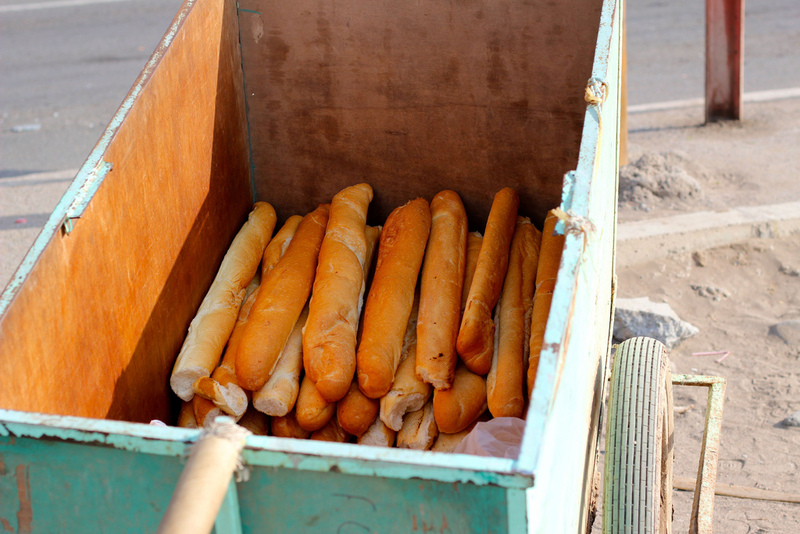 Several times a day delivery men in white trucks and vans with the seats removed dump baguettes from local bakeries into the carts. Fully stocked, the bread men scatter across Djibouti City, blaring their horns on familiar corners and outside of houses with predictable bread needs. The rounds of the bread men roughly correspond to the hours of prayer: sunrise, noon, afternoon, sunset, and one hour after sunset. The haunting, rising cadence of the call to prayer, issued from loudspeakers and murmured from my neighbors’ lips, soothes and stings. An outsider to the sacraments of Islam, I hear the adhan as savory and rich and, at the same time, as isolating and lonely. I pray in my home, alone. But the call to bread reaches all our ears with the same demand, conjuring the same response. Come, eat, be satisfied. The bread steams fresh six days of the week, and lies limp and cold on Fridays, the Islamic holy day and the only day the warshada (Somali for “bread bakeries”) don’t fire up until late afternoon. A single baguette, crusty on the outside and with an aloosha (“stomach”) of spongy fluff on the inside, costs twenty-five Djiboutian franc. Thirteen cents. A positive and affordable remnant of French colonization, now a staple in the Djiboutian diet. Occasionally the bread has become a source of tension. In 2009 the price of baguettes rose from 20 to 25 franc and minor riots ensued until hunger won out and people reluctantly started paying the increased rate. The bread man’s cart is a few inches longer than the arm-length baguettes piled inside and deep enough to hold dozens, so deep that to reach the last baguettes he has to stand on his tiptoes and strain, the cart pressing into his stomach. When he walks, the bread man steers his cart using two long handles. When he stops, he props the cart on its front end, the handles cocked like the horns of a butting goat. Baguettes spill down but not out, held secure by scraps of woven rice sacks. At the sound of the horn, children scurry from behind towers of discarded tires or curtained doorways, clutching precious coins in tight fists. Guards outside gated middle-class homes step over makeshift beds and purchase baguettes for their families, for their employers, for their own bellies, which grumble whenever the bread man appears. To keep the baguettes warm, the bread man wraps each order in strips of La Nation, the local newspaper, the narrow loaf poking out at both ends. Between prayer time and breakfast, when I am the only other person on the street, the bread man sometimes raises high his horn and honks in greeting as I jog by. Sometimes he throws down the contraption and runs a few meters with me, his plastic flip-flops slapping the ground. I know him as furinleh (“bread man”). I know his striped t-shirt, faded khakis, and the space between his front teeth the way I knew my mailman back in the States. Distant yet warm, unacquainted yet connected, we are comforted by the routine of our near-silent relationship. In the evenings I strain to hear the horn before the bread man turns up our street so I have time to find twenty-five francs between the cushions on the couch or stuck under car seats. I give it to my son and he runs outside to wait. The sun falls fast this close to the equator and darkness swallows up shadows, long and narrow, by the time the bread man arrives. Tomorrow, these rituals will begin again. The call to prayer, the delivery of bread. Each requires a few minutes set aside, the briefest glance at what is needed in the chaos of routine and work and life. Bread for the body. Bread for the soul.